New Delhi, Oct 25 (IANS) Despite warnings from a green court and environmental authorities, stubble-burning in Punjab and Haryana reached unprecedented levels to further deteriorate the air quality in the Delhi-National Capital Region on Wednesday. Dry and cold north-westerly winds blowing from Punjab and Haryana at speeds of 10-15 km per hour, according to weather analysts, will continue for the next few days, further worsening the air quality in Delhi-NCR. According to the System of Air Quality and Weather Forecasting and Research (SAFAR), nine of the 10 monitoring stations across Delhi recorded “very poor” air quality, with PM2.5 (particles with diameter less than 2.5 mm) ranging between 313-366 units. The international permissible limit for PM2.5 is 25 microgram per cubic metre while for India, it is 60. For PM10, the permissible limit is 100. In Delhi, Noida, and Gurugram, air quality deteriorated in the past 24 hours, with the Air Quality Index (AQI) recorded at ‘very-poor’. The index value was 344 in Delhi, 363 in Noida, and 318 in Gurugram. On Tuesday, the AQI at these three places was 309, 315, and 345 respectively. On Wednesday, air quality at Ghaziabad (NCR) was worse than post-Diwali (recorded on October 20) level, and was described as severe by the Central Pollution Control Board. The AQI in Ghaziabad was 425 on Wednesday, as compared with 412 on October 20. Meanwhile, satellite images from the National Aeronautics and Space Administrations’ FIRMS (Fire Information for Resource Management System) Web Fire Mapper show stubble-burning reached an all-time high with both Punjab and Haryana marked in red (depicting fire). Stubble-burning was part of the pollution control agenda of the Environment Pollution (Prevention and Control) Authority (EPCA), which a day before Diwali (October 19) implemented “very poor” and “severe” categories of its Graded Response Action Plan (GRAP) — which includes more strict measures — to curb air pollution in Delhi and adjoining areas. 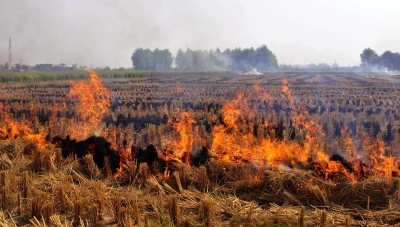 “It (stubble-burning) was an action point, but nothing much was done against stubble- burning as the National Green Tribunal (NGT) is already involved,” EPCA member Usmaan Naseem told IANS. According to EPCA officials, state authorities (Punjab, Haryana, Rajasthan and Uttar Pradesh) are supposed to keep a check on stubble-burning, as toxic smoke from such an action, along with weather conditions and wind speeds, impacts air quality in Delhi-NCR. The unabated stubble-burning in Punjab and Haryana, estimated to be around 35 million tonnes, was banned by the tribunal in November 2015. However, due to lack of support from the respective governments, farmers continued to burn paddy straw even as states demanded more funds from the Centre to support their farmers against the menace. “Air pollution is set to increase. People will complain of heaviness in breathing towards morning and evening hours. The north-westerly winds from Punjab and Haryana are slowing down in Delhi, and this will continue for some days,” Mahesh Palawat, Director of private weather forecast agency Skymet, told IANS.